Ask Hello Literacy a question. They will receive an automated email and will return to answer you as soon as possible. Please Login to ask your question. Jen is a K-12 Reading Specialist who lives in Raleigh, NC. She is a teacher with 23 years of classroom experience. She is a literacy consultant, intervention specialist, teacher trainer, and staff developer. She blogs about all things literacy at www.helloliteracy.com. 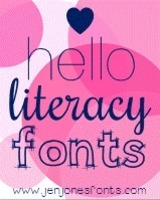 In addition to creating curriculum, she is also a font designer. You can contact her at helloliteracyatgmaildotcom if you would be interested in having her come to your school. Common Core Way; Classroom Learning Community based on Inquiry; Questions and Genuine Learning Opportunities; Hands-On Learning; 21st Century Learning: Communication, Collaboration, Critical Thinking, Creativity, Caring; Cooperative Learning, Opinionated Students Blogging Student Blog; TCRWP Reading & Writing Workshop; Common Core ELA; Science & Vocabulary Notebooks.